Its in my wish list for quite sometime to start a relationship with Citi and the Citibank Premier Miles Credit Card is indeed a decent credit card with Travel benefits to start with, except the renewal fee part. Also, there comes Rs.1000 cashback offer (still up) that was running for a while and so its the best time to apply for the Citibank Credit Card. Hence i applied online for the same just to know that i was rejected due to internal policy criteria. This is infact after address verification and document collection, which is common with other banks as well. I tried to email the Nodal Officer to find more info on the so called internal policy but again got an email response stating the same reason. It’s obvious that they don’t disclose the actual reason, but well, it’s clear when it comes to my account. So what is the actual reason? All my documents were perfect and the sales guy was 100% sure that the application will go through if CIBIL is okay. Now this is where the problem comes. I checked CIBIL to see an inquiry by Citi and the CIBIL score was well above 800 without any over-dues or blackmarks, but hey there are hell a lot of credit card accounts on the report. Flags Raised!! It’s obvious that some banks consider it to be risky when a person has too many active unsecured accounts like credit cards & personal loans as this exposes the customer to a very large credit line which is considered risky than those accounts having fewer cards. Before all these, i visited the Citibank branch to see if they have any offline offers. And when i mentioned him in the conversation that i have about 5+ cards, his tone went down. He mentioned that he had seen many applicant’s cards getting rejected when they have many other cards with them. Hence it’s obvious that CITI Bank has rejected my application for the same reason. However, I believe they’ll approve it if I apply for the second time, probably in 6 months or so. Though, they might expect a good repayment pattern and no other new cards added in meantime. Let’s see how it goes! Well mine got rejected Thrice with citibank despite having a great cibil score of more than 800. The third time, i came to know that it was because of the number of enquiries with cibil in the past year (bankbazar and paisabazar screwed it) and the number of active credit cards i had. So i waited for 8 months and applied again. Finally got it approved on the fourth time. Also the interest free credit period was 48 days rather than 50-52 days as with other credit card companies. Other than that its a very good credit card with an Earn rate of 1.8%. Sounds good, did you apply both online? Sometimes, they are approving easily if applied via branch, have experienced with HDFC, unsure of Citi. My application was rejected as it was on card to card basis and I was asked to submit proof of income. Then it was processed comfortably.. But coming to Rejection, SC and Yes are becoming notorious for this. There field executives who often physically verify do not send a favorable report. AND often multiple visits are made and they wish to meet the applicant during office hours..
Be careful about yes bank verification executive. For simple road or cross missed. They will send negative report . Yes bank verification executive team are very bad and nonsense. Agree… Yes bank CC was the only time ever my CC application was rejected. They have great product but pathetic, unprofessional people. They want to call the office number and they expect us to be seated at the desk whenever they call. May be they have been dealing with high school kids prior to this. Probably this is the reason why my yes bank exclusive application was rejected. I have 7-8 credit cards. Not sure if Yesbank too has this criteria. Exclusive is getting tough for many, tried for Preferred? No i havent and dont want too. i have 8 credit cards…..will get difficult to manage :-). btw completed Rs.4L milestone on Amex platinum travel yesterday. Thanks to you i really have made some good money since i followed you. That is true. My guru, who got me interested in CCs also had his application rejected ‘cos he had too many cards. In his case more than a dozen. I sympathise with YBL in this case. Yes bank is very bad in giving the CC limits. I have received a limit of 1.2L where as the card using which I have applied for had a limit of 5L. My yes first preferred approved immediately, card on card. Against 2.70 lacs credit limit on Citibank rewards card, yes preferred gave me 80k credit limit only. Siddharth, what is the Rs 1000 cashback offer on Citibank premier miles card ? Its annual and renewal fees are Rs 3000 ? – The Offer is valid for online applications between 31st Dec 2016 to 31st July 2017. – The customer should have spent a total at least Rs 5000 on all transactions put together within 60 days of the receipt of a credit card to be eligible for the offer; Cash back of Rs 1000 would be credited within 120 days of receipt of the credit card for such customers on best effort basis. The time line provided for effecting credit is only indicative of expected period and may vary from the actual date of credit. I got the 1000Rs cashback for taking Citi Rewards card. I took the card in December & I got the cashback 5 days back. It took nearly 5 months to get the cashback . 1000Rs for taking the card was a good deal. In Amex Gold also I got 1000Rs as welcome bonus(neither welcome reward points nor joining fee). Also got it reduced annual fee: 2250 per annum. Yes First preferred I got 1 month back as LTF on C2C basis on Regalia. But it took almost a a month to get processed. Now I use Diners Premium for almost all transactions. Then sometimes Regalia. Very rarely Citi/Yes bank. Amex for fuel purchase & 4x 1000Rs transactions. Many of my Friends have got citi cards by going a different way, they opted for Citi Shoppers Stop card, which is easily approved and then swapped it for any card of their choice.. Sounds interesting but i don’t really think a card type can override the internal criteria in a bank that has Global standards. Any idea how it actually differs going this way, like, was it instantly approved or kind of? I am using CITI card from 2008. And its a really interesting story on how banks used to issue CC very liberally those days. They don’t have any documents of mine with them, not even my photo!. All I did was filled the application on their website and I receive the card in 15-20 days to my address. I was like WOOW, how come they have processed it. BTW all the banks are very strict on their internal rules these days. Now I hold 13 credit cards! Getting a Citi Card is really very difficult initially. They have a few policies. They’ll almost NEVER issue you a credit card if you don’t have a credit card from some other bank already. The only Exception to this is IF you have a salary bank account with Citibank. I have a LifeTime Free Citi Rewards Card. I got rejected twice. On the third occasion I din’t want to apply but somehow I got an email from them that told me that my application had been rejected (This is almost 2-3 months after the actual previous rejection) as I did not meet their internal policy criteria. However, if I want my application to be reviewed then click here and there was a link. When I clicked there it asked me a few details. After about 1 week I got a call, documents were collected and they delivered the card within 7 days of picking my documents. That was simply unexpected. Their criteria is very tricky. Naah. It’s very difficult to say. Even, they have separate criteria (This is from the Document Collection and Verification Team) based on the region from where you are applying. I applied for this card when I was in Mumbai. I was told that I won’t be give the card. The reason they gave was pretty wierd- That I don’t have a company email address. I told them I work in a govt. setup and the govt doesn’t provide corporate email addresses but they didn’t budge. This happened on one occasion out of the 3 rejections. They didn’t even process my credit card application because of this deficit. Pretty strange right? Some might think that I am making this up but no, this is what I was told. Next time they gave me a different reason. My wife applied for the Card when she was in Kolkata. She got the card within 7 days. No rejections at all. I was just shocked. And when my application was finally approved, that time even I wasn’t asked for any corporate email or anything. I got my card within 7 days. So, God knows what they do and how they approve your application. Until you get the card, you cannot be sure if they’ll accept your application or not. Pretty weird. Why would someone apply for a personal card from a corporate email ID. How about the Redemption options available with Yesbank credit cards? I think its very very limited right? Yes its limited. Redeeming for Flight tickets would be the best option. They have increased the options now. I redeemed the points for amazon vouchers last month. I had an Jet Airways Citi card and when they cancelled that association sometime in 2011 i think, i was given an offer for PremierMiles from Citi with annual fees of 1k instead of 3k for lifetime. At that time, i had all LTF cards only, so i thought for a while and accepted. So they gave me another card- rewards as LTF which i recently closed. When i applied for Yes Preferred, i gave citi as card on card basis and i had 6 CC’s already and when i recently applied for Amex Membership rewards i had 7 CC’s (7th was yes cc). I like the rewards on the citi PM card, since as a welcome gift, they gave all JP miles i earned till date as rewards and that was approx 14k worth which covered 14 years of fees. And also redeemed all my JP miles for free flights. But now the redemption is 40 % instead of 50% when they started. Booking on their websites always gives 10x points, and fares are reasonable (sometimes lesser than other websites). Hope this helps, and citi accepts your application next time around. Maybe have yourself referred from someone via citi referral? Referral doesn’t make any difference in this approval process though. Citi bank has very weird criteria, I had Hutch citi credit card for a long time, since the product was discontinued I was offered rewards card LTF during renewal process in 2011 everything was going great and one day I got a sms stating due to change in internal policy my card has been deactivated and asked for full payment to be cleared in a month as per conversation with nodal officer was informed that my residence area is blacklisted. I had using the card since 2007 without any late payment; don’t understand how the bank can just cancel the card without any prior information. Again after a year or so I got a call from citi offering me the same card LTF without any documents based on my past record which I agreed but my bad luck in 2015 again citi cancel my card for the reason residence area is blacklisted and again had offered me the card last year in December but this time I was completely fed up. I leave in Mumbai suburbs works for MNC all other credit cards providers have no issue with my residence area but only citi. Blacklisting area is also used by amex. Some of my relatives lives in an area in jaipur which somehow is blacklisted by amex and its in main city. I just filled the application online, the documents were collected in next 3 days and I got the card in 10 days. I think so Citi’s criteria for CC approval differs from city to city (I’m based in Pune), as I didn’t face any problem in getting the card. and Congrats on your first card! Can you please tell me which credit card you applied? is it CITY Reward or CITY Cash Back. It was Citi Cash Back card. 1) Holding too many cards isn’t seen as a positive. It shows too much depence on credit. 2) If you put in enquires for credit cards very often (online or through the bank branch), it’s counted as a ‘hard enquiry’. 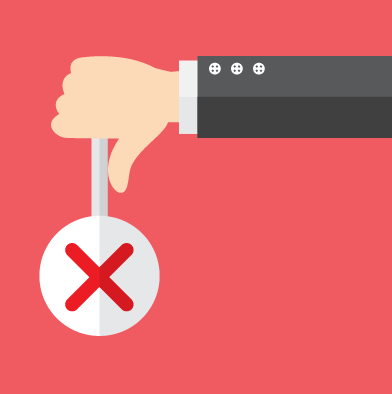 Too many of those and it negatively impacts your credit score. 3) The trick that someone mentioned about swapping a lower card to a higher one is TRUE. Apply for a lower tier card and make sure it comes with a credit limit of 2L or more. Then wait for a few months and then ask them to ‘swap’ the card for the premier miles card. how they revert back ? what is procedure ? I applied through online and its been 3 days. First up, excellent site, there’s a lot of helpful information here. I would like to know your views on applying for multiple credit cards within a short span of time. I currently hold Regalia First, which is my regular card. I’m a regular traveller on Jet Airways and want to collect JPMiles quickly, so I recently applied for the ICICI Sapphiro Card (to make use of their double miles offer), and have just got it approved. I also see that the Jet Airways Amex Card is offering a double JP Miles joining bonus to those who apply on the JetPrivilege website. I’m tempted to apply for this card too, but I’m not sure whether doing so will adversely effect my credit rating/CIBIL score. What are your thoughts on this? Its okay to apply for approx 3 cards in 6-9 months time. My HDFC Diners Premium Credit Card application got rejected today. I had submitted all docs on 3rd June itself. Salary and other credentials were meeting HDFC criteria. I have no loan and credit card history. Field executives were insisting on verifying local address during office hours. I had raised this concern to nodal officer. It is still pending. Don’t know if it was rejected due to address verification or no credit score or any other reason. HDFC mail mentions generic reason (not meeting internal criteria) for rejection. Escalations to Nodal officers might help sometimes. Open a bank account with Citi to get your card approved next time. Does anyone got renewal fee waiver for citi miles? If yes let me know. 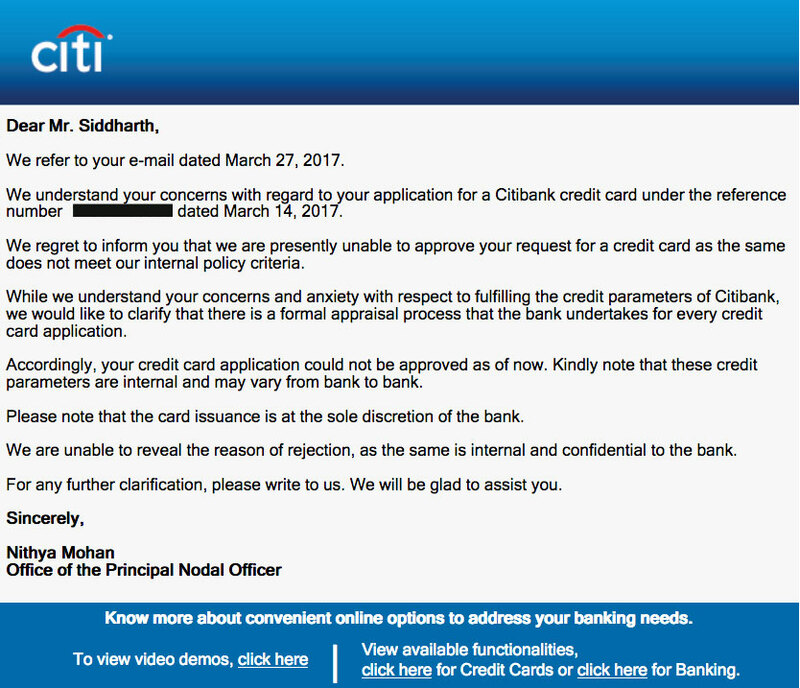 Mine Citi Credit card application was also rejected this year in Feb-March…. I assume Citi se ekk rejection to zaroori hai …. I have no loan, credit card on my hand. My annual income is complied to the minimum requirements. Therefore, I applied citibank clear visa credit card, but at the end my application is unsuccessful. I have no idea why my application rejected. It is because i am working under contract with one year so they reject my application? I hope to get an answer from banker. Yet my application for HDFC card is rejected twice now in 2 years. Applied online both times, documents collected, field executive was certain it will be approved. I got an SMS from HDFC within 3 days that my card has been approved ” in-principle”. And then after 4 days an email came saying your application is rejected because you don’t meet bank’s internal criteria!!! Not sure how this works. Anyone know the trick to get a HDFC card?? I have No a/c with them. Interesting. Anyone else heard about it guys? Yes, they are only collecting ID and address proof. This must be in response to Yes bank’s similar aggressive stance of approving credit card with Aadhar, Pan.For me they gave Yes preferred same way, although i did hold a savings account with YBL. Siddharth, I have recently started following your card reviews – appreciate the wonderful analysis and discussions from you & your team! After my first transaction of Rs 10k, my account was credited 10k points. Thanks for the reply, looks like the CC executive may have provided wrong info. It happens sometimes, but let me try giving a call once again and hopefully they will give correct info this time. Keeping my fingers crossed…..
Sid, did you apply again? If yes is it approved? Might apply sometime in 2018. Will keep the article updated if i do. I have Citibank salary account but my credit card was rejected due to low salary when I contacted to bank person they told your income should be 20k plus and my income is just 19,975rs. Apply when u meet the criteria. Else if you have any other credit card let them know about that also. Why don’t you ask for a raise in your current job first 😉 or better still change to a better paying one? I currently have Citibank Cashback card n I hold Citi cc since 2007. Every person should have 1 Citibank credit card as they run quite frequent offers for online shopping. Every 2-3 months you will see 10% cashback offer on Flipkart and Amazon. Citibank is also giving 20% cashback on Bigbasket for purchase above INR 1500 upto max 500 cashback since May 2017. This offer runs for 1st to 5th day of every month and cashback is supposed to be credited within 90 days. Though I have received cashback credit within 60-70 days most of the time. They run weekly offer on Makemytrip as well as Reliance digital offers from time to time. Citibank seems to have a tricky process for credit card approval. I already have a home loan and 2 credit cards(HDFC & SBI). My application for Indian Oil Card has been rejected for the second time. Firstly, they told that I don’t have enough credit score and at the same time, HDFC approved my application for Regalia First with a decent limit(I had no prior relationship with HDFC Bank while applying for the card). After waiting for 6 months, I applied again and this time they’ve rejected again by stating the application does not meet our internal credit acceptance parameters. Has anyone any idea about their credit acceptance parameters? Maybe because of your (emi + credit limit) to Salary ratio.Can you share that?We may get some better insight into the algorithms that go into approving or rejecting citi card applications. Citi bank approval criteria is quite mysterious. I applied for a citi rewards card through referral. The only documents they asked were id proof and address proof(no income documents) . It took them quite a while to collect the documents as my residential address wasn’t under the service area. After waiting for almost 10 days I got an email stating that my application has been rejected because of internal policy, although my cibil score was more than 820 and the verification guy told me that citi needs a cibil of 750+. What came as a surprise to me was that after 3 days I got a text message stating that I have applied for citi bank credit card (this time with different application number) and it takes 7 days to process it. However, the very next day I got another text message from citi stating that my card has been approved and it’d be dispatched in 2 days. Luckily I got the card in next three days. Maybe your city is not in their list or your area pincode is blacklisted due to past default in payment by some of their cc customers. One thing you can do is open a savings ac with citibank and maybe apply again after 6 months. Ofcourse do this only if you want a Citicard badly. I really doubt that they’ll blacklist Delhi-01. I will try once again after 6 months by applying through a branch this time. I think opening an account with Citi just for the sake of credit card would not be a good idea. HDFC already has some great offers these days. I hold Citibank Cashback cc and getting cashback points even for wallet topups. Also the t&c tells I will get 1 point worth Re 1 on spending 200/-. This becomes 0.5% cashback, but almost all the times I get 2-4% cashback points. Once 500 points gets accumulated, 500 is adjusted against next month statement. So I am having full of cashback with this cc. This is despite me not spending on any of their 5% cashback categories like utility bills or dining spends. Recently, HDFC had a similar goof up where they gave extra points on their Platinum Debit Card and now they have deducted all the extra points from the existing points. Now my account is showing total available points as -500. Moreover, after Citi rejected the application for IOC Card I applied for the Amex MRCC and they have approved the application within a week. As Citi is crediting more RPs every month for me since more than 4-6 months, I am less worried about any goof up taking place in my case. More so bcoz 1 RP is equal to Re 1 in Citi Cashback cc. Their basis for RPs calculation is as mysterious as approval of their cards it seems. Citibank cc was my first cc. Congrats for your Amex MRCC. I can’t apply for this bcoz my city is not in their serviceable area. I hold HDFC DCB with 7 digits limit and AMEX, IndusInd with 9l digits limit each but still Citibank is rejecting my application from last 3 years. This was the 4th time I applied and got rejected. May be they don’t care for small businessmen. Same with SBI, stuck with 50k limit from last 8 years and they just don’t increase my limit even with all the documents. Did you try applying for the basic cards or trying for PM/prestige in first shot? Later might be tough unless IT is very high. SBI LE is easier now. I got LE after 1 yr on SBI, in 48 hrs of submitting the docs online. Siddhart have you applied again for Citi card ? Very happy to let you and others know that my credit limit on Citibank Cashback CC is increased today from 45K to 2 lacs directly. My cibil score is above 800 but having 6 credit cards at the moment and in the past (8-10 Months back) my citi bank credit card application was rejected. Few days back i visited bankbazar applied Citibank Indian Oil card. After two days i received a call for document collection but before the executive collect document i received an email from CITIBANK saying sorry due to some internal reasons, we are unable to process your credit card application. When executive came, he said still give me documents, it will be processed, and surprisingly after approx 6 later i received sms from CITIBANK that your card is approved and will reach you in next 2 working days. This is when i am holding 6 credit cards, out of which one (HDFC Club Milles) was issued last month after spliting the limit of my regalia First and yes bank’s credit card 4 months back. The only difference was last time i applied directly through CITI bank site and this time through BankBazaar. Satish from how long you hold citibank card? How much is your annual spends ? Hello Mr. Satish Kumar Agarwal did you provide any documents for your citibank card limit enhancement ? You got a really big jump. I got citibank card this month. What should be my way of approach for limit enhancement ? Hi friends I recently got a Citibank First Citizen credit card. I was fortunate to get a Citibank card in my first attempt ( even though they so not serve my city) . Limit is 75 k. Friends I need your valuable suggestions. What should be my best strategy to get credit limit enhancement in future ? I am holding Citibank CC since last 11 years approx. It was my 1st credit card. Annual spends on Citi CC is approx. 1 lacs pa. I provided last 3 months salary slip as well as latest ITR scanned copy to Citi on email. Wait at least 6 months for LE. Citibank is not good at providing LE outside metro cities AFAIK. Did you apply for Citi cards again @siddharth? “Based on your representation, we are reprocessing your Credit card application. Issuance of a Credit card is subject to your application meeting all the credit acceptance parameters of the Bank. We will keep you informed of the application status latest by September 14, 2018”. Finally today on 10 Sep received SMS “Congratulations! Your application for a Citibank Credit Card has been approved. You card will be dispatched within 2 working days”. It seems like the process of approval in Citi Bank has been simplified now. Wednesday, 18th Sep 2018: Got a call from Citi for document collection(Only Aadhaar was asked even though I am working in different city). The document was picked up on the same day. Thursday, 20th Sep 2018: Got one verification call from Citi. Friday, 21st Sep 2018: Got a text stating that application has been approved. Monday, 24th Sep 2018: Card delivered. First of all Siddharth , excellent site and resource for cards ! Kudos ! Citibank is ridiculous. I applied for their lowest category card – Citi rewards card simply because vodafone had some offer of 50% on my postpaid and I just clicked it. They called asking all the details and then I get an email my application has been rejected ! due to “overdue outstanding”. Which is BS at best. My CIBIL score is 826. My overdue or even due on any of the cards is 0. Never crossed more than 50% CC usage ever. I hold an HDFC Infinia and a Kotak Privy League. I don’t have a single active or otherwise loan in my name. I bank with 5 banks and am the highest tier customer will all of them. PS: Above being said, I did find in my CIBIL report lot of loan inquiries which were never done by me, some were as frivolous as loan of INR 1k ! I think CIBIL and other rating agencies need to be strict about whose access is allowed and who can upload data that needs to be verified. I applies for citi rewards card and verified by 2 times. I was told one more call will come. How many time they verify for the card. Each bank has its own eligibility criteria before even they look into your CIBIL. This criterion is more stringent for Self employed people. I recently applied for a Citi rewards card as they had some great festive offers on Amazon. I received a call after a few days who asked for my Name, DOB and Income. After this, he said due to some internal criteria we are unable to forward your card application but is not in the position to disclose the reason. I knew my income or CIBIL score was not an issue here (I hold Amex Platinum Charge Card from 2010 onwards). Infact my CIBIL was not even checked as per the recent CIBIL report generated. However, they still rejected the application at the first stage itself. I got no email or SMS. It was denied on the phone by the person who called me. Later I came to know the actual reason for rejection was that I mentioned same address for residence and office!! If I reckon the process of getting Amex card back in 2010, I do remember my first application was rejected just because I did not have a landline number to provide in the application. Same was approved after 6 months when I reapplied after getting landline (which I got with Airtel broadband). Within 10 days I had my card delivered! That being said its far more easier for Salaried person working in a reputed MNC to get a card. I remember during my early 20s when I was working with a big MNC, I was offered Citi card just on the basis of my ID card. Many people got it, but that time I did not choose to apply. Thank you for your application for a CITIBANK REWARDS CARD. We have reviewed your application and the documents provided, in line with the bank’s internal policy guidelines and operating processes. We regret to inform you that we are currently unable to approve your application, as the application does not meet our internal credit acceptance parameters. If you require any further clarification or assistance, please contact our 24-hour CitiPhone helpline (applicable across India) at 1860 210 2484 or +91 22 4955 2484, and we will be happy to help you. Kindly remember to quote the application reference no. (as mentioned above) in all correspondence . P.S: Previously I do not hold any credit cards, this was my first credit card application . Does anyone here knows how to get a citi bank credit card with self employed tag, as they aren’t providing cards to self employed, any tricks or way? Which Shoppers Stop store? Which part of the country are you talking of? No offers here anywhere (Chandigarh)! Here in Lucknow also this card is not offered via Shoppers stop. But First Citizen desk guy told in metro cities like Delhi one can apply in Shoppers stop’s FC desk. Shivi if Citibank do not have branch in your city than they will not issue credit card. I applied in Kolkata’s Shopperstop Store. We have Cutibank in Chandigarh, Captain. Just didn’t find any Citi Stall in Shoppers Stop here! Even in NCR in every shoppers Stop. Citi guys are ready to give you cards. Once you’re enrolled, go ask the store reception that you want to get the Citi card. Just keep in mind that getting a co-branded card is not the best way to step into Citi ecosystem, for future benefits like credit limit enhancement and qualifying for better products. Try for PM card direct if you think you’d qualify. Hey amex guy, actually i dont qualify for their cards because i am self employed and they don’t provide cards for self employed individuals and i want citi cards because of the value they hold, secondly can you please explain me can i swap this card for citi rewards or indian oil card in coming future, is that possible? Can the Citi rewards card be applied on the basis of existing credit card statement? Hello captain, can you please help me in detail as i don’t shop in shoppers stop and never will mostly, secondly how to make shoppers stop first citizen card? Almost all metro cities shoppers stop have this facility. Shoppers stop loyalty card is called First Citizen & have a desk for them exclusively in each store. Goto First Citizen desk and ask for the Citibank First Citizen card. They will provide details n complete formalities for this card. Check your city Shoppers stop for details. Hardik if you buy any item from Shopperstop than you can get the loyalty card by paying a fee of about Rs. 299 ( not sure) . Just ask the guy in billing desk. But before that you have to find Citibank credit card guy in the store because Citibank operates in very limited number of Indian cities. I visited shopper stop store yesterday. i am first citizen member, they refused for such offer. Which city do you live in? Received 50% auto le offer on my Citi Cashback cc. This is 8 months after I got LE from them, though that was payslip based. I have a doubt. If it is auto LE than we are not suppose to provide income documents right ? How much and where was your spends ? How much was your income if I may ask ? I have completed exactly 6 months on my Citibank Shopperstop First Citizen credit card and spends are more than 2 lakhs. Don’t know when i will get aut LE . I was talking about my previous LE 8 months back which was payslip based. For this LE I was not asked for any documents. Approx spends 5-10K per month, all online spends. Citibank Cashback cc limit enhancement took 4 working days after acceptance of the auto LE offer. HDFC just requires otp verification on netbanking for the same and does le within minutes. Even RBL auto le took less than 5 minutes to reflect in app. Citibank’s offers aren’t really auto LE, and they never say so. A system detects that you maybe eligible for a particular enhancement. When you accept, a real human looks over your file and approves. Not really auto. You can get denied. Amex Guy do you think I can get LE in my citi card ? I have only Rs. 3.40 lakhs ITR. OK. Thanks for this valuable insight. Hi Hardik, last year I applied for Citi cash back CC. They never asked any income proof. Only they collected my aadhaar and pan only and offered card. But am a employee and CITI collected my company and salary details through cibil report and gave me the limit of 2x of my salary. I didn’t inform my company details but in the card delivery address they mentioned both of my residence and company address. I got my card as self employed, but it was years back. I would not worry too much about the CIBIL employment information. Most banks put incomplete stuff on it, and report only retains the last update. Banks know this and I don’t think they care. What you actually need to care about — keep enquiries to 0 for 6-8 months. Usually let Citi be one of your first 2 cards. Definitely you won’t get it as your 4-5th card unless your ITR is extremely large. A lot depends on your PIN code too with Citi, as well as the report the field guy sends. And also have a bank account with them helps! Hey Sid, Three times my CITI card was rejected and this time I had escalated this to the country head of credit cards. I received a call from the response unit and informed that the card was rejected because simultaneously other financial institution had checked my CIBIL hence it was rejected. As per them, chances of getting CITI credit card approved out of 10 application will be one because of their stringent rules. Anyway lost hope with CITI bank and never gonna apply again. Being self employed, I found it very difficult to get HDFC/ SBI credit card. Somehow got approved Citi rewards card with lower limit, which has increased now but very slowly. Currently HSBC is promoting their cards and they clearly mention that self employed applications will not be processed.